After being sued by the Department of Justice for failing to comply with the Help America Vote Act (HAVA), New York is now facing a September 2007 deadline to implement new voting equipment. In the next few months, counties across the state will have to choose between either high-tech, touch screen Directing Recording Electronic (DRE) devices or low-tech, optical scan electronic systems. Hommel, a computer technology expert who runs the website WheresThePaper.org, has been actively engaged in trying to convince the New York City Board of Elections to go with the cheaper optical scan machines, which simply electronically tally pre-existing paper ballots, instead of the more complex and expensive Direct Recording Electronic devices, which perform all functions of the voting process electronically, from casting the ballot, to recording it, to tallying the results. “Everybody knows you can tamper with a paper ballot. If we can’t protect something we can see, how are we going to protect something we can’t see?” said Hommel during a Sept. 30 training session instructing citizens how to advocate on behalf of the optical scan systems. In the case of technological malfunction, DREs can present a logistical nightmare for voters who may have to wait in long lines to cast ballots, or not be able to vote at all, “which is one of the worst things you can imagine happening on Election Day,” said Lawrence Norden, who leads the voting technology assessment project at the Brennan Center for Justice. “One of the benefits of precinct count optical scan is that a voter fills out the ballot, even if the machine scanner breaks down, the ballot is still there and it can still be counted,” said Norden. New York also requires a full-face ballot – meaning any touch DRE interface would have to be sized to accommodate the full ballot listing. Current models put forward by vendors measure about four feet by two feet, leaving large questions about where to store and how to transport machines. 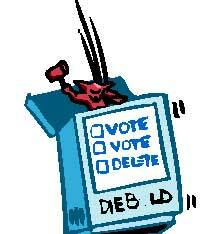 DREs can only service one voter at a time, making it necessary for precincts to buy multiple machines. Precinct-based optical scanners, which are about the size of a large fax machine, require only one machine per polling place and will allow multiple voters to vote at once. Even though counties haven’t yet chosen the machines, the fact that four companies even submitted optical scan machines for certification in the state of New York represents a victory for voting rights’ activists. “We’re winning,” said Hommel, who is convinced that optical scan systems will eventually win out if citizens actively push for them.